HOLLYWOOD — Brains, beauty, a flair for Seminole fashion and a gift for intelligent gab was all it took for two Hollywood sisters to take both crowns in the 2013 Miss Florida Seminole Princess Pageant. The new Miss Florida Seminole Tia Blais-Billie, 17, and Jr. Miss Florida Seminole Brianna Blais-Billie, 16, won July 27 after nearly two hours of competition featuring 11 equally pretty and talented contestants. The daughters of France Blais-Billie and the late July Billie, of the Otter Clan, are the only sisters to serve simultaneously since the pageant began more than five decades ago. Brianna, a junior at Pine Crest School, was first to walk across the stage at Tribal Headquarters as new royalty. She was crowned and sashed by outgoing Jr. Miss Florida Seminole Brianna Nunez. “I was thinking it would be crazy and cool if both of us won, but when they actually called (Tia’s) name I just started crying. I am so proud of her,” Brianna said. Tia’s eyes also welled with happy tears as she was decked in pageant regalia by outgoing Miss Florida Seminole Alexis Aguilar. The senior at Pine Crest School said she looks forward to representing the Seminole Tribe throughout her one-year reign. Tia also wants to bring awareness to Native issues and support positive change throughout Indian Country. “Not all Native people are as blessed as we are,” she said. Brianna said she wants to take her crown to Disney World – but not for fun. She wants to enlighten the corporation about Native American stereotypes that are perpetuated at the resort. Wanda Bowers, chairwoman of the pageant and Miss Florida Seminole 1968 and 1969, said pageant winners get plenty of opportunities for the “very serious matter” of representing the Tribe. The girls will be the face and voice of the Tribe at events nationwide and perhaps, in foreign countries. “In our matriarchy, being a woman does not mean you stand in the background. She’ll be ready to stand up and speak up to answer any question in the Tribal realm,” Bowers said. 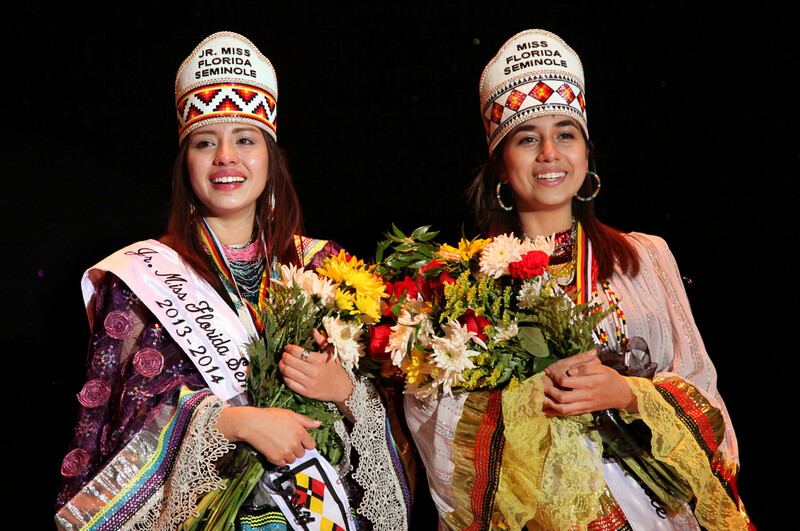 Pageant rules required all contestants to model traditional Seminole dresses, demonstrate a cultural skill and answer impromptu questions about Tribal history, structure and ways to improve the community. Miss Florida Seminole contestants also included Kirsten Doney, of Brighton, and Alexis Jumper of Hollywood. Other Jr. Miss hopefuls were Thomlynn Billie, of Big Cypress; Jennifer Holdiness and Baylee Micco, of Hollywood; Deliah Carrillo and Brydgett Koontz, of Brighton; and Randee Osceola and Marrisa Sanchez, of Immokalee. Gloria Wilson, Miss Florida Seminole 1975 and 1976 and now the Tribe’s director of Community Planning, said the pageant experience gives contestants confidence to go on to bigger adventures. “The more they get out there, the more they learn, become known and earn respect,” said Wilson, who serves with 10 other former princesses on the pageant committee. Since holding princess titles, Wilson has been the Policy and Information Development Specialist for United South & Eastern Tribes Inc., managed an Elvis impersonator in Nashville, revamped the Alligator Times into The Seminole Tribune, contributed to the foundation of Seminole Media Productions, started the Seminole Police Explorers program and fostered 13 children – among other things. “This year, all of the young women in the pageant made up a very dynamic group. It didn’t matter who won because every one of them could do the job and do it well,” Wilson said. The Blais-Billie sisters stood side by side for photographs with Tribal officials, visiting Seminole Nation of Oklahoma princesses and pageant judges: Miss Indian World 2013 Kansas Begaye, of the Navajo Nation; Northern Cheyenne Tribe member Manny King, of Haskell Indian Nations University; and Miss Florida USA Brittany Oldehoff, of Fort Lauderdale. Grant Gravitt Jr., executive producer and director of the Miss Florida USA Pageant, has attended the Seminole pageant for decades as a guest and friend of the Tribe. Miss Florida Seminole 2005, Christine McCall, is Wanda Bowers’ daughter and the pageant’s secretary and stage director. For Connie Gowen, the first Miss Florida Seminole who was appointed with the crown in 1957 by Tribal Council, being the official “backstage grandma” to countless contestants has been a blessing and honor. Sprite and cheery, Gowen arrives prepared with makeup mirrors, hair pins and last-minute sewing supplies. A Tribal elder now, Gowen is best known in the Tribe for making sweetgrass baskets, Seminole dolls and patchwork jackets.